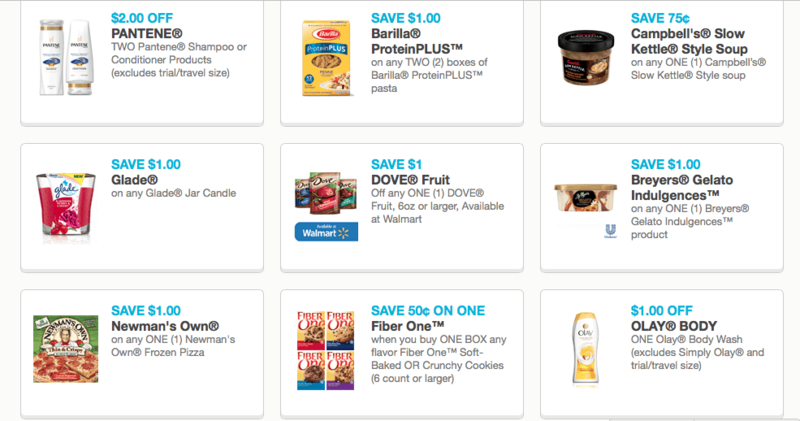 Although I’ve shared how I save money when shopping for healthy groceries without couponing. 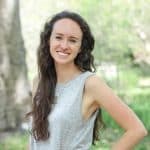 I actually love couponing, too, so I decided to share a guide to couponing with a few of my tips and tricks for finding coupons I’ll actually use. Hopefully, you’ll find out about one or two ways you didn’t know before! There are a few different ways I get coupons, and all of these ways combined take about 20 minutes or less before my weekly shopping trip. 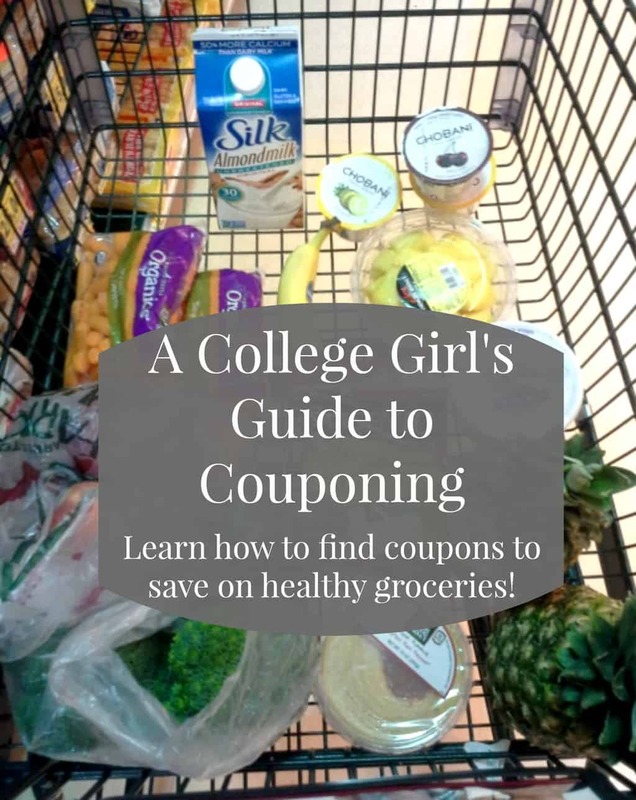 As you get used to doing it, it gets faster, and as a college student, couponing can be an awesome way to save some extra money. I do try to make sure that I don’t spend too long looking for coupons since time is money, right? The most important part of quick and efficient couponing is knowing where to look, so let’s talk about the best spots to find coupons you’ll actually want to use! 1. 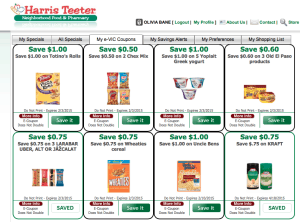 Your grocery store’s online coupons. Almost every grocery store has online coupons that go directly onto your store rewards card once you click on them, so you don’t even have to print them. Of the grocery stores near me, Kroger and Harris Teeter usually have some good options. The awesome thing about online coupons is that you can clip an online coupon AND use a manufacturer’s coupon in the store, so you can end up saving some serious money (if $3 instead of $1.50 counts as “serious money” ;)). 2. Emails from the companies you love. If you’re like me, you don’t like signing up for a bunch of emails, but some companies email out great printable coupons. I have a separate email address for company sign-ups and other things like that, and none of these companies send out an obnoxious number of emails, so to me, it’s worth signing up. Other companies that do this include Palermo’s Pizza, Turkey Hill Dairy, Freschetta Pizza, and I’m sure there are a ton of others– these are just the ones I know! 3. The websites of your favorite brands. 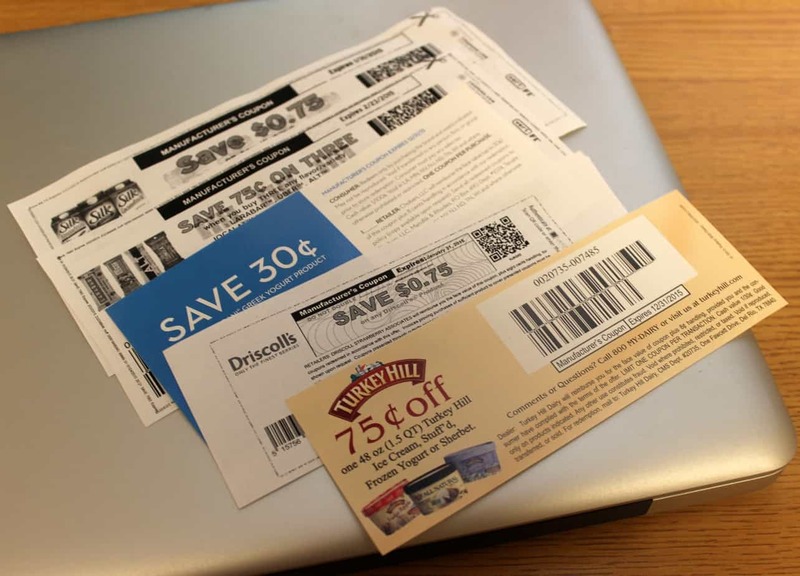 You might be surprised by how many companies offer coupons right on their websites! If I see an awesome sale in my store’s online flyer for say, Stonyfield Greek yogurt, I could check Stonyfield’s website to see if they have coupons, print a few, and then stock up and get a great deal by combining the sale and coupons. A lot of companies put coupons on their Facebook pages, too. 4. Couponing sites. Lozo.com and coupons.com both have good coupons! If you’re a healthy eater, you can scroll right past the junk food coupons and almost always find some coupons for healthy foods, as well as things like household items. 5. A quick Google search. 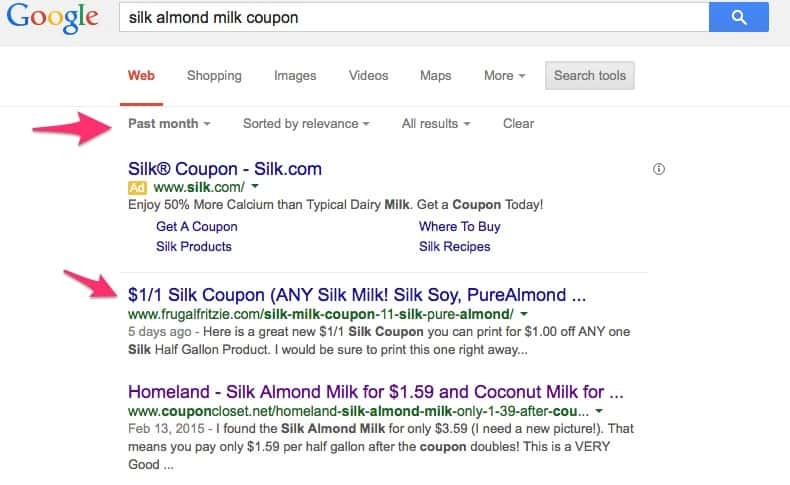 If you type in the type of coupon you’re looking for, you’ll often be able to find one quickly. I always click “Search tools” and filter my results to be from within the last month so that a bunch of expired coupons don’t come up. Some grocery stores will double your coupon up to a certain value. For instance, if you use a $.75 coupon, the cash register will automatically take off $1.50. The way it works is that the store will match the manufacturer’s coupon amount up to a certain dollar amount. Not all stores do this, but some of the stores near me, like Harris Teeter, will match coupons as long as the coupon’s amount is less than $1. Sometimes, Harris Teeter has “super double coupon” sales where they’ll match any coupon up to $2! So, if you had a $1.50 off coupon, they’d take $3 off. Not a bad deal, and in these kinds of sales, you can often end up getting items for free, almost free, or in a few cases, you might even be able to MAKE money! 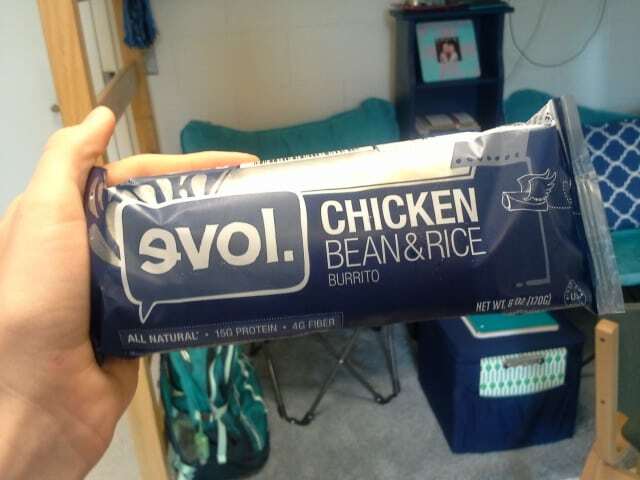 Case in point: evol burritos were on sale for $2.50. 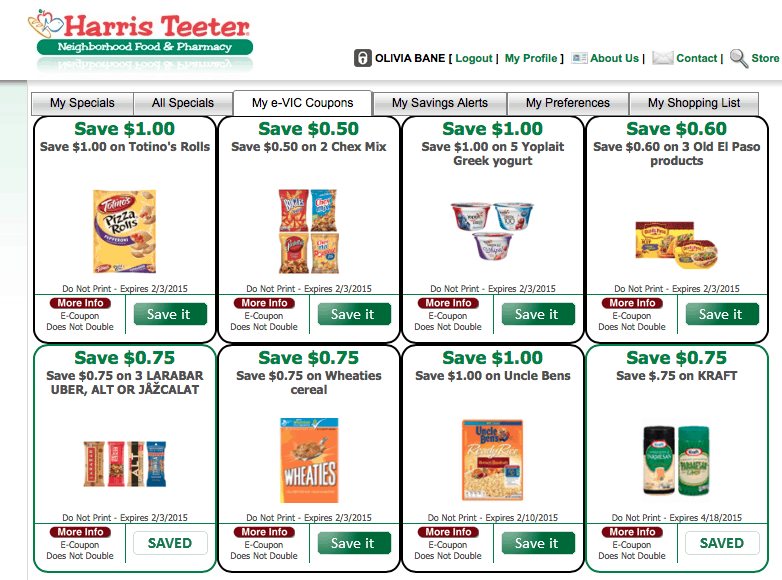 I had a couple $1.50 coupons from evol’s website, and Harris Teeter was doing a “super double” coupon sale that week. $2.50- (2 x $1.50) = -$0.50. So I actually made $0.50 on each one I bought! Fun, right? If you’d like to see which grocery stores in your state double coupons, you can click HERE. By checking out the sale flyer before you go to the store and doing a quick online search for coupons, you can end up scoring some great deals. Hope this guide to couponing was helpful for you! *Be sure to check out my latest post on saving money on groceries with your smartphone! I recommend a couple of rebate apps that are really easy and fun to use. Sounds like you got an awesome deal! Isn’t it so fun to get things for free?! This is so great!! I love that you find all these ways to save! I feel like our taste buds are so similar! I drink Unsweetened Almond Milk like it’s my job and can’t go a day without carrots… I love hummus and fresh fruit and yogurt too!! 🙂 Great stuff! These are awesome tips haha I’ve always wanted to try couponing but I KNOW I’d become obsessed. Seriously. The high of saving money on food would seriously take over my life haha. Who knew double couponing was a thing? I feel the same way 🙂 It’s fun to know that you’re getting the best possible deal! Those are all great ideas! I always feel like I’ve hit the lottery whenever I can a double coupon deal. haha. I love that rice, pasta, beans, and bananas are all so delicious because you’re right– they’re so cheap! Thanks for your tips, Ellie! this is great! i believe that by savng 75 cents here and there you can save tons of money later! I agree, it definitely adds up! Thanks for stopping by, Orly! These tips are super helpful! I definitely need to make a separate email for signups like that, such a great idea! I think couponing is great and totally worth the time, if you know where to look, which now I know way more thanks to this! I always wondered about the double couponing too. I’m not so sure my brain could handle the extreme couponing though haha. The people on that show really know their stuff though! Coupons are my fave. I need to start doing more of it, I’m just so lazy about it sometimes. Great post! You are so good at coupon-ing! It’s impressive.. I feel like I would try and reason in my head why I should by something “just because” it has a coupon though.. I’ve been known to do that when there are tempting sales at the store! (It’s bad). So cool, I wish we had this down under! Coupon in is def not something we rally do here, otherwise I would be all over it! Sigh.. I wish Kuwait had coupons. That would make grocery shopping 10x cheaper! I love store couponing. Safeway has this thing called ‘just4u’ for online coupons. It’s so easy and convenient. I would love to go coupon crazy, but we hardly have any here in the UK. I do love watching that extreme couponing program though. This was super helpful! I get emails from my grocery store, but I never thought about getting them from the brands I buy! I’m definitely going to go sign up for those! Thanks! I’m so glad this was helpful for you, Carlee! !